The 12th Dazhao Temple Fair will be held in Hohhot, the capital of North China's Inner Mongolia autonomous region from Feb 10 to Feb 19. 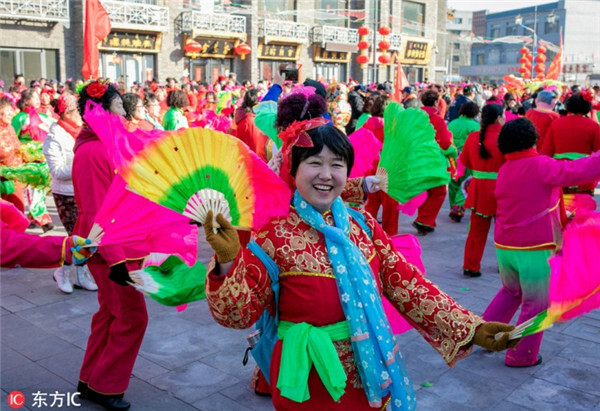 Sponsored by the Hohhot Municipal Bureau of Culture, Press, Publication, Radio, Film and Television, the temple fair has been held 11 times and has become an indispensable event for local residents to participate during the Spring Festival period, which is half of the first month of the lunar new year. According to local authorities, there will be three main parts of this year's event. Residents can enjoy traditional folklore performances, participate in activities that are celebrating 40 years of reform and opening up, as well as the 70th anniversary of the People's Republic of China, and have fun exploring innovative technologies such as VR, 3D printing, and smart robots.